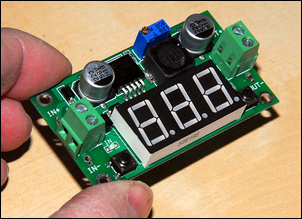 This story is on how you can build your own bench power supply. So why would you need one? 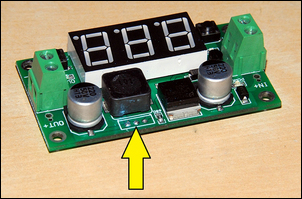 If you do anything with DIY electronics, you need a variable voltage power supply. Turn a knob and you have a 5-volt supply for testing things like MAP sensors and airflow meters. Turn the knob a bit further and you have a 12V supply for testing a car radio. Turn the knob a bit further and you have 13.8V for charging a small battery – or drop it back a little and keep a car battery on float charge. And if you have an old laptop power supply around the place, you can achieve all that for under $10 and a few hours of work. The module cost from about AUD$7, delivered to your letterbox. That’s just stunningly cheap – especially as it includes the on-board 3-digit LED voltmeter! The maximum peak current that the module can handle is 3 amps; it can handle 2 amps for longer periods and 1 amp continuously. If you’d like the continuous power handling figure raised, fit a heatsink to the IC. Note that the module has short-circuit and over-temperature shutdown built in. In addition to this module, you’ll need an old ex-laptop power supply – these are readily available in currents of about 3 amps and voltages up to about 20V. Any one of these that has anything like these specs written on it will be fine – and because they’re often thrown away when a laptop is discarded, they’re not hard to find. I added an external pot to allow the voltage to be easily altered (a 20 kilo ohm unit) and a small toggle switch to allow the output to be turned on an off (often useful when you are testing a circuit and want to quickly disconnect power to make a change). If you don’t have these parts, they’re available from electronic stores like Jaycar. I also used a couple of output power terminals – old speaker terminals salvaged from a discarded speaker. 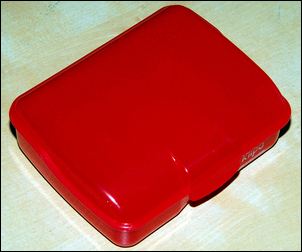 So that the LED voltmeter could be seen through the box, I used a red translucent food storage box purchased from a supermarket for $2. 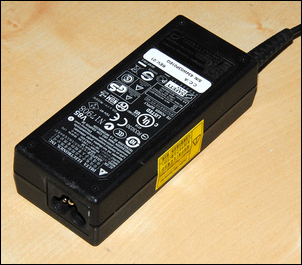 The first step is to ensure that the laptop power supply is working correctly. Cut off the low voltage DC plug and bare the wires. If there are more than two wires, the two thicker wires will be the power supply. Connect your multimeter to these wires, turn on mains power, and check that you have the specified voltage (e.g. 21V) on the output. Also at this stage confirm which wire is positive and which is negative. Disconnect mains power and observing the correct polarity, connect the laptop power supply to the ‘IN’ terminals of the module. Plug back into mains power and check that when you rotate the on-board pot, the output voltage varies. By pressing the on-board buttons, you can turn the voltmeter on and off, and change the reading from input voltage to output voltage. The trickiest part of the project is wiring-in the external pot. 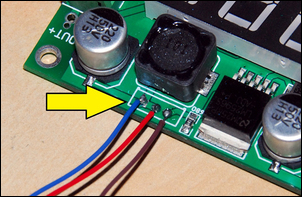 Because the printed circuit board is double-sided, it is best if you carefully use a pair of pliers to crush the on-board pot until its pieces can be removed, revealed the solder pads to which it is connected (arrowed). Carefully solder extension wires to these pads and then connect them to the external 20K pot, using the same wiring pin-outs on the new pot as were used on the old. Reconnect mains power and check that you can vary the module output voltage by rotating the external pot. I chose to mount a switch in the output circuit. 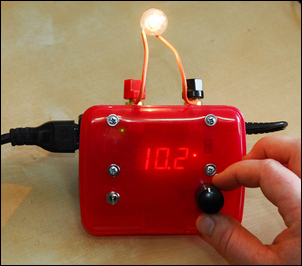 That is, when mains power is applied to the power supply, the LED display is always illuminated. The switch just turns the output on and off. Before assembling the box, I set the module pushbuttons to switch the LED voltmeter on, and to configure it to show output voltage. The module is mounted using stand-offs formed by screws and multiple nuts, inserted from the front. With the wiring completed, I used double-sided tape to stick the translucent box to the ex laptop power supply, positioning the two ‘blocks’ so that the display and controls sit angled upwards. In use the power supply works very well. The regulation is good – the output voltage doesn’t change much when you connect a load. The supply will also cope with short-term short circuits. However, you can’t set the output voltage down to very small increments – because the original on-board pot was a 10-turn unit and we’re using a one-turn pot, the fine resolution of the original control isn’t retained. That said, on the prototype and using a 3.42 amp, 19V power supply, you can set the output at about 0.2 volt intervals from 1.1V to 18V. 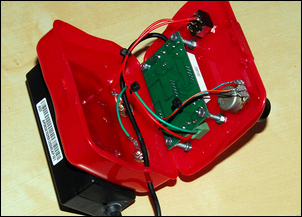 This is a great project – cheap, very useful, rugged and (for beginners in electronics) quite safe to make.